If you walk along Fraser Highway in Downtown Langley, you will notice a large parking lot across from 207th Street. This was a former municipal parking lot that was underutilized. At one point, there was a development proposal which included ground-level retail. The market conditions weren’t right, and this development proposal didn’t move forward. The Official Community Plan has designated the site of the parking lot as a combination of medium-density residential and Downtown Commercial. 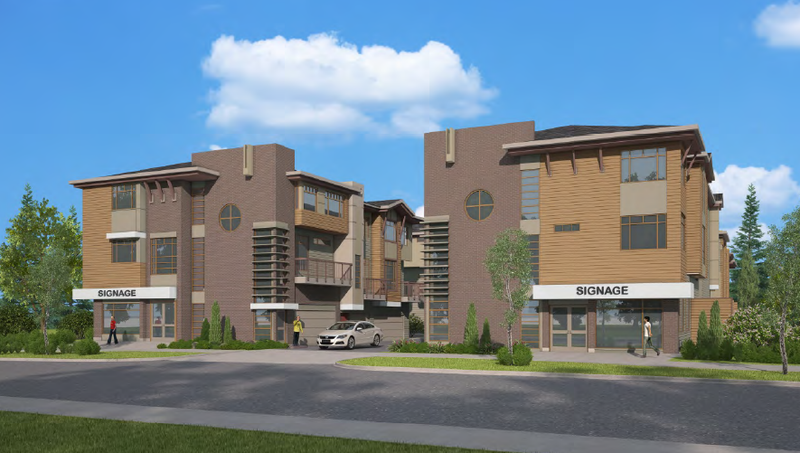 The City of Langley has received a rezoning request which would enable the construction of a 3-storey, 21-unit townhouse development on the site. The density of the proposed townhouse complex is only one unit above the low-density multi-family zoning designation. 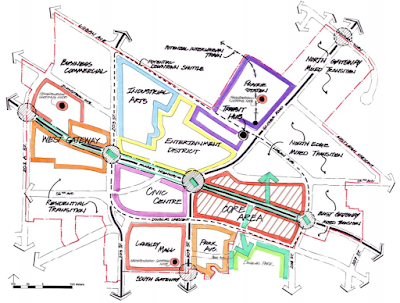 In the Downtown Langley Plan, this area is known as the “East Gateway.” The area is suppose to transition gracefully from the more retail-focused Downtown Core, to the residential-only areas surrounding the core. In reality, it is more of an “anything goes” area. 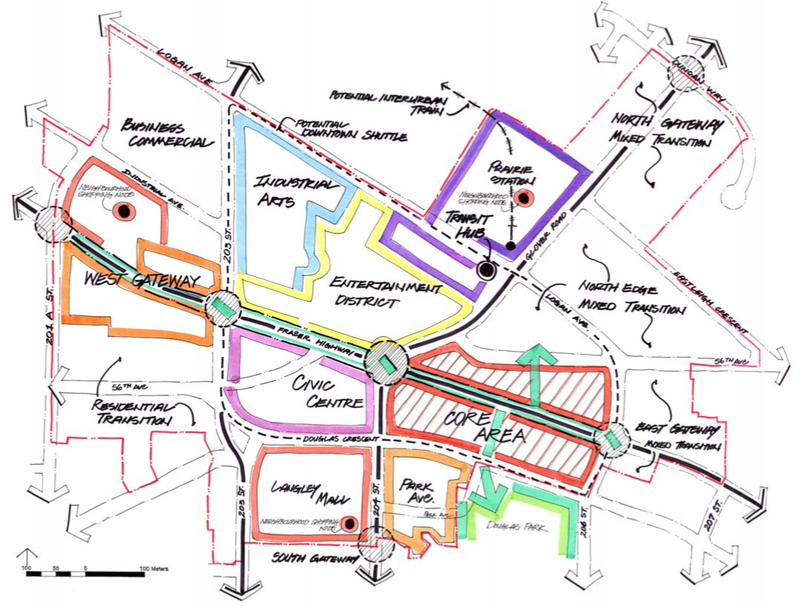 Downtown Langley Urban Design Concept. Select image to enlarge. Residential-only buildings don’t activate the street and create the same appealing environment as street-front restaurants, cafes, and shops. Over the last decade, the residential-only Paddington Station in the West Gateway and Serenade in the Park Avenue area of Downtown Langley have been built. While high-quality projects, they do create activity dead-zones. Residential-only projects are being built in Downtown Langley because of the current soft demand for retail space. If too many residential-only projects are built in Downtown Langley, the ability to maintain an appealing, walkable Downtown may be compromised. Getting back to the townhouse proposal. The Township of Langley approved a very similar townhouse project a few years ago, but instead of having street-fronting decks, it had small-scale storefronts. Drawing of a mixed-use development on 83rd Avenue in the Township of Langley. Select image to enlarge. It would have been great to see this kind of design in Downtown Langley. It would support home-based business, and create an engaging, pedestrian-friendly public realm. Sometimes a simple change can make all the difference. I wonder if Council will suggest any changes to the development. The City of Langley is holding a public hearing for the rezoning on Monday, January 25 at 7pm. Details are posted on the City’s website. Some sort of retail, at least along Fraser Highway would be ideal for this development. I also worry about creating a small dead zone. At least a couple storefronts at the end of the buildings would go a long ways. Will you be bringing this information up at the public hearing?